Josh is originally from Peabody, Massachusetts. He graduated with his bachelor’s degree from Case Western Reserve University in 2011 and his master’s degree from Tufts University in 2014, both in biomedical engineering. He joined the WPI Myocardial Regeneration Lab in the summer of 2014 for his PhD. 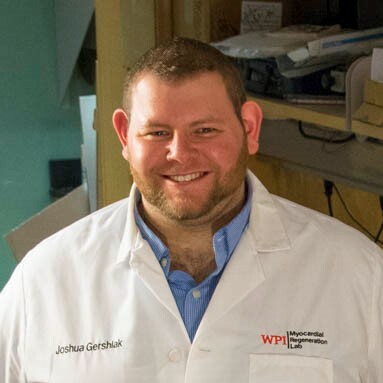 Josh’s research focuses on adapting decellularization techniques to plants in order to create new, sustainable, and perfusable scaffolds for different tissue engineering applications. Mesenchymal stem cells ability to generate traction stress in response to substrate stiffness is modulated by the changing extracellular matrix composition of the heart during development, BBRC, Joshua Gershlak et al., 2013. Beta 1 integrin binding plays a role in the constant traction force generation in response to varying stiffness for cells grown on mature cardiac extracellular matrix, Experimental Cell Research, Joshua Gershlak, Lauren Black, 2015.